A New York bagel scene in … Union County? When I think about big-city life, I think about going out for bagels on Sunday morning. Now that ritual can be found in Charlotte’s Union County suburbs. Back in college, a Jewish buddy took me to his parents’ home in New York over a spring vacation. Would I like to go out for bagels? I discovered this was no grab-and-go. Instead the whole family lingered over plates loaded with soft swirls of cream cheese, the thin-shaved salmon called lox, sliced onions, tomatoes and tart little berry-like things I learned were capers. Not like any sandwiches this small-town boy knew. But the food and the camaraderie made me a convert. So when Levine Museum opened its current exhibit “Down Home: Jewish Life in North Carolina,” I began asking visitors if Charlotte has a bagel scene. They pointed to Poppys on Providence Road, to the Bagel Bin & Deli in Huntersville. But the most enthusiastic nods were for Poppyseeds in Union County between Matthews and Stallings. Stallings? That used to be where suburbia trailed off into farmland, the antithesis of “big city.” But in recent years, Stallings and Union County have become the Charlotte area’s fastest-growing destination for newcomers. 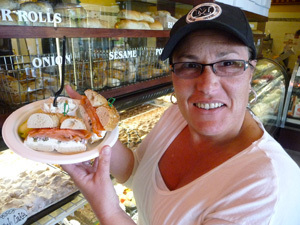 Kim Porto, a transplant from Suffolk County, Long Island, opened Poppyseeds two years ago. She grew up in her family’s bagel deli in Selden, New York. And handmade bagels in more than a dozen flavors. Porto sliced me an egg-glazed “everything” bagel, slathered it thick with cream cheese, a layer of lox, onions, tomatoes and capers. A big bite of the big city.